Wigan Athletic star: We can be City slickers! Gavin Massey admits he’s revelling in being back in the spotlight at Wigan Athletic – after fearing earlier this season whether his injury nightmare would ever end. The 26-year-old has scored twice in his last five matches his longest run of consecutive appearances of the campaign. And he’s hoping to remain fighting fit for the run-in and help Latics get over the line to Championship safety. After starting the campaign in blistering form, Massey was struck down by a freak hamstring pull at QPR at the end of August that ruled him out for four months. Having returned to the fold over Christmas, Massey suffered a recurrence of the problem on New Year’s Day, which ruled him out for a further five weeks. With boss Paul Cook mindful of rushing him back, four games on the bench prepared him for a safe return to the starting line-up. And he’s shown he’s determined to make up for lost time by giving Latics an added dimension at the top end. “It’s just great being back in the side again and scoring goals,” he told the Wigan Post. “Obviously there were dark parts of the season when I wasn’t playing, and you’re just looking anywhere for some positivity. “To be fair I think I’ve found that since I’ve been back in the team – and I probably could have done even more. “I know I should have scored on Saturday (against Brentford), when I had the big chance, clean through, although it was a good save. “But it kind of levels itself up, because if you look at the goal against Bolton (the previous week), it’s gone in off the defender and the post when it could so easily have stayed out. Four points in the last two matches have given Latics a lift heading into back-to-back away games at Bristol City this weekend and Hull next Wednesday. And Massey says a continuation of the performance levels will give Latics a good chance of ending the woeful form on the road. “I think in our last two games we’ve put in strong performances – the Bolton one especially,” he said. “But even Brentford, they’re a good footballing side and we didn’t allow them a single chance really. “We probably could have won that game as well, but we’re taking it as another building block on the way to this weekend. “It’s hard to say how any points we’ll need to confirm our safety, because of how the league is going. “Every team can beat any other on the day, so you can’t just say: ‘One win’, ‘two’ wins’ or anything like that. “All we can do is take each game at a time, hopefully one win is all it takes and that comes on Saturday! Massey well remembers Wigan’s only win on the road this term, spanning 21 matches in all competitions. He scored in the 3-0 victory at Stoke on August 22, his last appearance before his lengthy lay-off. “We’re all aware we haven’t won for so long away from home, and Saturday would be a perfect time to put it right,” he acknowledged. 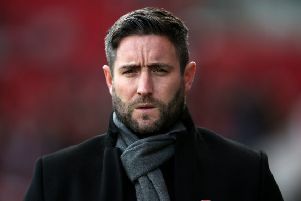 “It won’t be easy though, because Bristol City are flying and are in the thick of the play-off picture. “These are the games you look forward to as a player, against the big teams at the top end, at their place. “It’ll be a decent atmosphere, and hopefully we can rise to the occasion and come away with a positive result. “We beat them in the home game here in September, and that will give us confidence. “I didn’t play in that game, I’d just got injured, but I watched the game on TV and the boys were class that day.